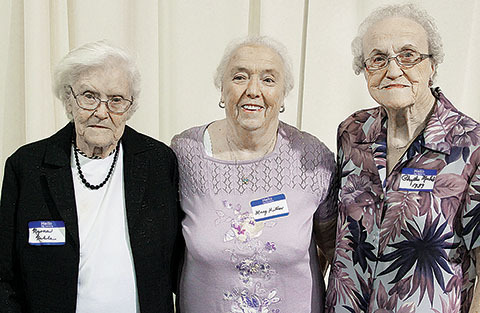 Alumni honors went to (l.-r.) Myrna Noble, Mary Kitner and Phyllis Michel. A total of 240 Albion/Boone Central alumni and guests attended the 2016 Alumni Banquet last Saturday night, June 18, at the Boone County Fairgrounds Events Center. Alumni President Sheila Sup gave the welcome and served as mistress of ceremonies. Honored as the oldest alumni present were Myrna Noble, class of 1937 and Phyllis Michel, class of 1939. Traveling the farthest to attend (1,760 miles) was Mary Kitner of Rossberg, OR, a member of the class of 1951. • 25-year class of 1991 — Theresa Grape. The 10-year class of 2006 had a separate celebration and did not attend the banquet. Four graduates of 2016 each received $500 scholarships from the Albion/Boone Central Alumni Association. Those receiving scholarships were Kaylie Beierman, Sheldon Beierman, Amber Hall and Maverick Loeffler.